Rejoice Churro lovers! 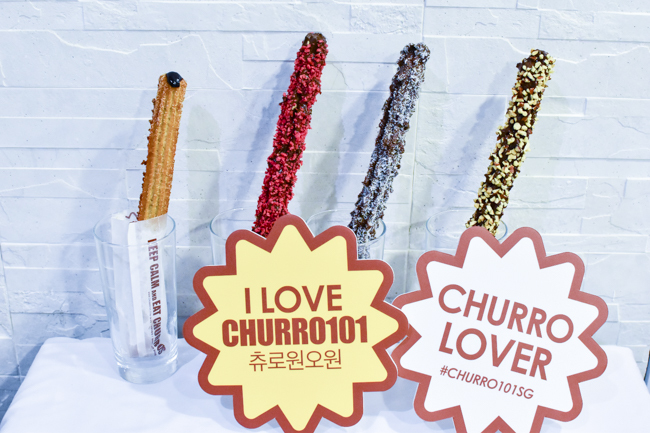 Popular Korean Churro chain Churro101 츄러스 has come to Singapore at Bugis Plus. 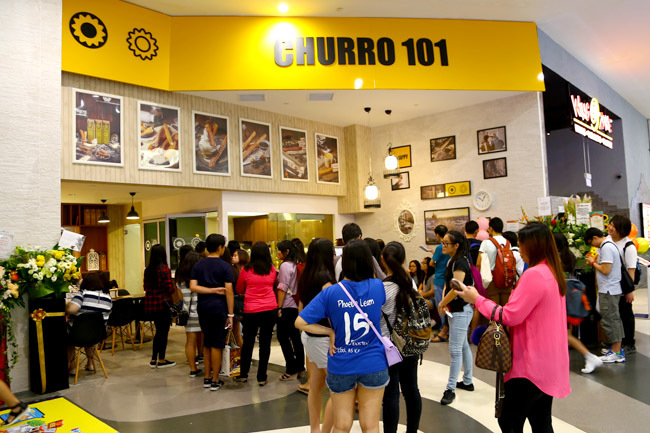 Churro101 has gained a huge fan base since its opening in 2011. Some of its fans include top K-pop groups likes Girls’ Generation, F(x), Miss A and Girls’ Days. Now, check out THE QUEUE on its opening day. And the video captures just part of it. 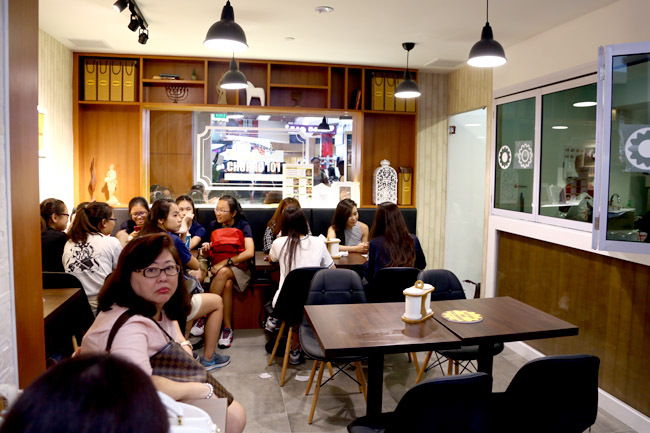 There could easily be more than a hundred customers in line during mid-day, and the waiting time needed is anticipated to be between 1 to 3 hours. There are already more than 11k likes & shares of this page alone (see above social media buttons) and we foresee that the crowd will last for a while till the hype dies down. It seems that the quality and service will be compromised for the time being. Online reviews for Day 1 weren’t favourable, some giving 1 star for its “wet, lumpy and raw” insides. 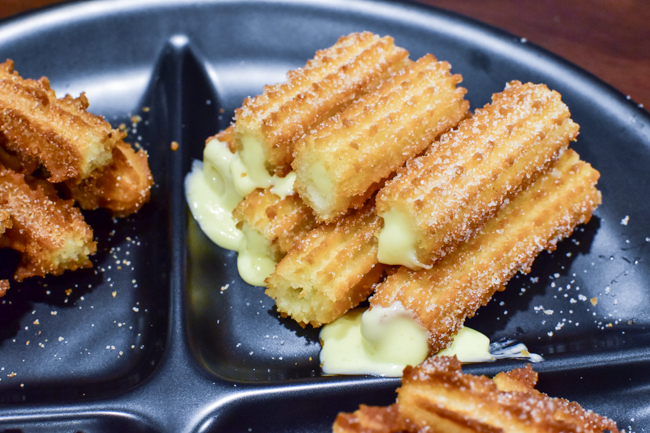 Located at L4 Bugis Plus (Bye Bye Ireland’s Potatoes), Churro101 has adopted a show kitchen concept where people get to see how the churros are being prepared, making the process more visual and engaging. 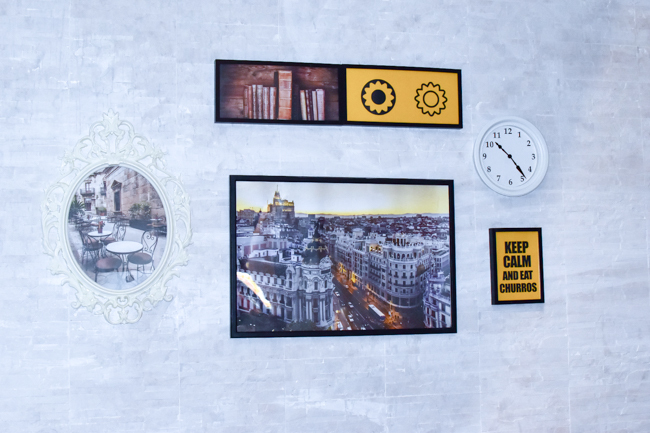 In sync with the corporate branding of Churro101, there are mismatched furniture and quirky props and a photo-wall in this 441 square feet space. I foresee a lot of OOTD pictures at the photowall with huge Victorian boudoir chair (when the queues die down). 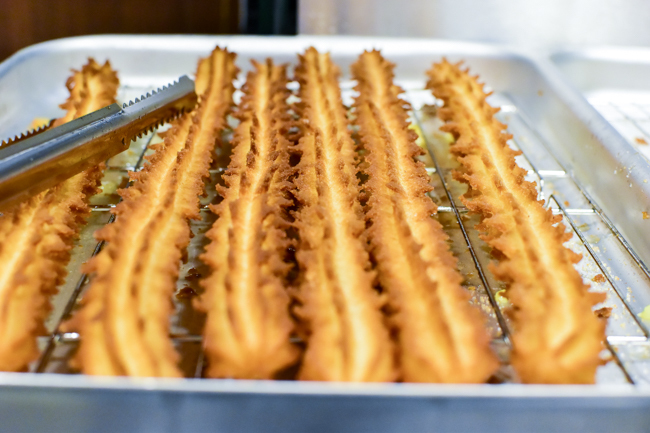 Its founder Iris Choi, a Le Cordon Bleu graduate, created a winning recipe to brush off the notion that churros were mere carnival food. We tried the the Plain Churro ($3.30) – handmade from scratch, about 30cm long (Length varies depending on the churro maker). It had a crispy buttery exterior coupled with an airy interior, seemed worth the money spent. You can also top up another 20 cents to get the signature Cinnamon Churro ($3.50) for a sweeter experience. If you like something more colourful and adventurous-tasting, try the filled flavours such as Cream Cheese Churro ($4.70), Chocolate Filled Churro ($4.50) and Milk Mustard Churro ($4.50). The former had a tangy creamy filling, while the latter two were leaning towards being very sweet. 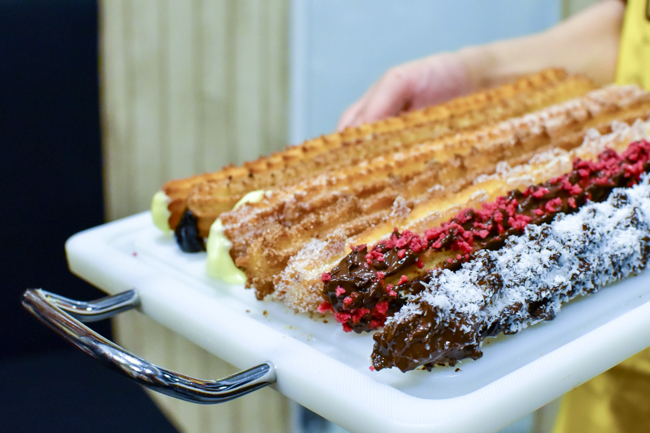 Chocolate lovers can also look out for Dark Chocolate Churro ($5.40) with an option of adding different toppings (Almond Slices, Strawberry Crunch, Coconut Powder) at $0.50 per topping. While I liked how rich the chocolate is, it was lacking in the bitter aftertaste that I would like to have in dark chocolate. Perhaps naming it ‘Milk Chocolate Churro’ might be more apt. With a pocket-friendly pricetag, this is the kind of food to derive some sweet high and happiness. 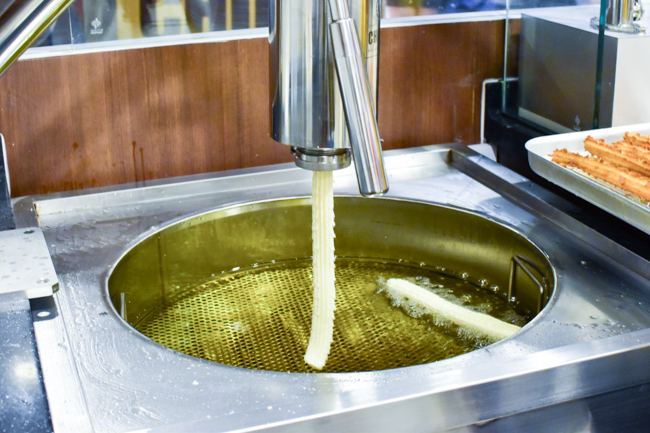 However, we still think the boyfriend (or girlfriend) is better than churros – they give you the real happiness. * Written by Daniel’s Food Diary Writer Hannah Chia. Find her at @MsHannahChia on instagram. Beg to to differ. Churros is undercooked raw and lumpy!